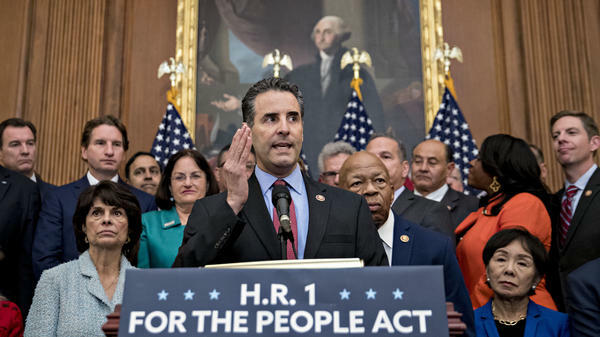 Rep. John Sarbanes, D-Md., speaks during a news conference to unveil House Democrats' anti-corruption bill, the For the People Act, at the U.S. Capitol on Friday. If the bill ever becomes law, it's unlikely to happen this year. Republicans control the Senate, President Trump is in the White House, and the GOP vehemently opposes the basic approach of HR 1. "This is obviously a pretty radical expansion of the regulation of political speech," said David Keating, president of the conservative Institute for Free Speech. "If this bill had become law now," he said, anti-Trump groups "would find it very difficult to speak as effectively as they have over the past two years." Some of the bill's provisions push the envelope, including reaching into state law. To settle the controversy over redistricting, the bill would simply take away the power of state legislatures to draw congressional districts and have independent commissions do it instead. That way, presumably, the local politicians could no longer gerrymander the districts to help their party and cripple the opposition. But some other proposals are not surprising. The bill includes an update of the Disclose Act, a pro-transparency measure that Democrats have introduced regularly since 2010 — not that Republicans are any more likely to embrace it than they were back then. Voter registration would be made easier. Citizens could register online or get registered automatically, via data from driver's licenses or other government sources. For federal elections, states would have to provide same-day registration and at least 15 days of early voting. Election Day would be a federal holiday. Federal elections would require paper ballots to prevent computer tampering. State chief election officials couldn't get involved in federal campaigns. The bill would declare an intent to revive core anti-discrimination provisions of the Voting Rights Act of 1965 that were effectively shut down by the Supreme Court six years ago. It would also state that failing to vote isn't grounds for taking away a person's voter registration. Provisions from the Disclose Act would expand the prohibition on foreign political money and mandate the disclosure of the big donors behind politically active 501(c)(4) social welfare organizations. Digital companies, like Facebook and Google, would have to set up public databases cataloging political ad purchase requests of $500 or more and create new measures to block ad buys by foreign nationals. Presidential inaugural committees would have to disclose expenditures, in addition to the existing requirement for donor disclosure. This is a response to reports of unexplained spending by Trump's inaugural committee. A new matching-fund program would support House candidates who agree to raise only small-dollar contributions. (Similar provisions for Senate candidates would have to come from the Senate.) The public financing system for presidential candidates, largely irrelevant since 2012, would be updated. The bill would quash "sidecar" superPACs that support individual candidates. Presidents and vice presidents would have to release their tax returns, something that happened routinely in past administrations but not in this one. Presidents-elect would need ethics plans for their transition teams and would have to file financial disclosures within 30 days of taking office. The bill would tell presidents and vice presidents they should act as if they are covered by the conflict-of-interest law, which actually exempts them. Again, this wasn't an issue in previous administrations because past presidents did not have the volume of business entanglements that Trump has. House members would be barred from serving on corporate boards. Rep. Chris Collins, R-N.Y., is under indictment for allegedly using inside information he gained as a corporate board member. House members would be forbidden to use taxpayer money to pay penalties for employment discrimination. Former Rep. Blake Farenthold, R-Texas, used $84,000 in federal funds to settle a sexual harassment claim by a former staffer, said he would repay it, but changed his mind after leaving office. Congress passed a bipartisan measure in December requiring members to pay out of their own pocket for some settlements and court judgments in sexual misconduct cases. The Supreme Court would have to get a code of ethics, something it has never had. The laws regulating foreign and domestic lobbying would be expanded.